Barter Books : Barter Books : Barter Bikkies. 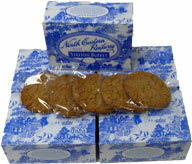 Five BB Ginger Biscuits in gift box. In a gift box which is a copy of the original North East Railway cardboard lunch box from 1937.